I am now a member of a select club: I'm one of the very few who has driven Tesla's new all-electric Model S luxury sedan. Last week, the company allowed a few members of the local press to test drive the car for about 15 minutes each. That's not enough time for a thorough evaluation, but it is enough for some strong initial impressions. The first words that come to mind about the Model S are "fast" and "fun." The car I drove, which is a higher-end, $77,400 version, has some serious pickup. 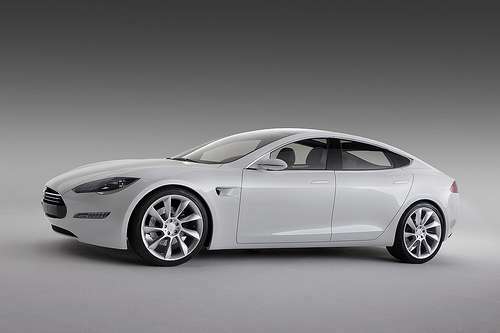 Tesla says it will reach 60 miles per hour in 5.9 seconds and is governor-limited to 130 miles per hour. Those aren't world-beating numbers - Tesla is selling a "performance" version of the Model S that will get to 60 mph in 4.4 seconds - but they're plenty fast for most drivers. When you punch the accelerator, you don't get the throaty roar of a V-8 engine, but there's something strange and thrilling about feeling a car rapidly reach highway speeds and beyond with no sounds other than a little road and wind noise. It almost feels like being on the Starship Enterprise as it goes into warp drive. And the nice thing about that power is that it's instantaneous. You don't have to downshift or wait for the transmission to do so for you, because basically there is no gear box. Also, the power is available even at highway speeds - instantly - when you want to pass someone. The Model S feels solid and takes curves tightly. The car's battery pack is beneath the cockpit rather than in the trunk or in the front, giving it a low center of gravity and better stability. And its onboard computers automatically lower its suspension as you get up to highway speeds. One compelling thing about driving the car is the degree to which you can personalize the experience. You can adjust the suspension up or down to avoid dragging the cowl when you dip into a driveway, say. You can adjust the steering to make it tighter, like that in a sports car, or looser, like that in a traditional American luxury car. And you can adjust the feel of the accelerator. The standard setting, which provides a big recharge boost to the battery, gives the car the feeling of having a standard transmission; as you let up on the accelerator, the car slows markedly, as if you had downshifted into a lower gear. But you can change it so the accelerator feels more like one in a car with an automatic transmission, where there's less deceleration when you let up the pedal. The trade-off is that you also send less charge back to the batteries. On the outside, the Model S looks like a cross between a Jaguar and a Maserati. It may be the latest in high-tech automobiles, but it doesn't scream "electric car!" And that's a good thing. On the inside, the car feels a bit Spartan. It has leather seats and wood trim, but the cabin is a bit bland, minimal and utilitarian. What stands out in the Model S cabin is the 17-inch touch-screen display that serves as its center console. Through it, you can adjust the radio, the driving experience and the climate control. You also use it to view video from the rear-facing camera, maps from Google Maps and even surf the Web through its built-in browser. The display is large enough to allow you to view its menu controls, a map and radio buttons all at the same time. The car has a built-in cellular data radio, which allows users not only to surf the Web, but also get turn-by-turn navigation and access Internet radio. But the "connectivity package" that allows you to do all that is optional. Tesla isn't yet disclosing the price. Unfortunately, the console is somewhat limited. In terms of its entertainment capabilities, for example, users can access TuneIn radio and Slacker radio through the touch screen, but not Pandora, Spotify, Google Music or any other Internet radio service. You can stream music from such services to the console from your smartphone, but you can't control those apps through the console itself. Tesla representatives said they plan on adding that capability eventually. The console also doesn't support voice control. So you can't press a button and tell it to dial a phone number for you or change the channel. Tesla's chief technology officer, J.B. Straubel, said the company plans to add voice control using Google Voice, but it's not available at launch. And sorry, iPhone fans, the company doesn't yet plan to support the new hands-free capabilities Apple is adding to its Siri feature. The biggest worry consumers have about electric cars is how far they can drive between charges. I obviously didn't get to test that, but Tesla has tried to ease that concern. Its base Model S can go 160 miles on a charge, it says, while the version I drove will last as much as 300 miles. That's plenty to get you around town and even head out for a weekend trip and back. Tesla's also working on some rapid-charge technology that will let users recharge their car while on a trip in as little as 30 minutes. That's a bit longer than the typical fill-up. But the typical gas car doesn't have the environmental bona fides of the Model S - or offer quite as much of a thrill. -Likes: Rapid, noiseless acceleration; ability to customize the driving experience; large touch-screen console; contemporary design. -Dislikes: Unremarkable interior; limited entertainment features on console; no support for controlling smartphones through touch-screen; limited range on base model. -Specs: On tested model, 85 kilowatt-hour, 300-mile-range battery pack; leather interior, 21-inch wheels.
. Also, the power is available even at highway speeds - instantly - when you want to pass someone. That's a very interesting aspect. I wonder if this will lead to crashes as people underestimate the passing power of the EV behind them (or overestimate their own passing power when trying to follow EVs). If my business was doing better, I'd be in the queue. Since I don't use any of the "services" mentioned as lacking, no problem. I like quiet and I drive to drive and go places, not be entertained by something I can get at home. Is it just me or is 21" wheels huge? why are the wheels so big? Bigger wheels are always better, most people agree they look better (up to a point), they rotate slower at the same vehicle speed producing less friction heating and longer tire life, they give the car a higher effective final drive ratio meaning a lower engine speed for the same vehicle speed which also improves fuel efficiency and reduced wear on the engine parts. It also looks like the platform is palnned as a common basis for a coupe, crossover and SUV (which would merit the bigger wheels). It almost feels like being on the Starship Enterprise as it goes into warp drive. Spock: This new warp drive feels very similar to a 21st century Tesla. I'm not so certain. This is priced for the (upper) middle class. A class that is fast disappearing throughout the world. batteries in this computer I'm using : they cost too much. the range drops rather significantly. The EPA claims 265 miles and may not have used AC. That "30 minute recharge" is a half recharge. The second half will take longer. "Made in California" ? I don't know about the rest of it, but about half its value are the batteries and they are made by Panasonic, and I seriously doubt they are made in the good old USA. Toyota Camry and many Hondas and other foreign cars probably have a higher local content. This would make a nice local driver, if I could afford it. For long trips I'll stick with flying or ICE powered vehicles for now. I wouldn't be interested in stopping every few hundred miles for a long recharge.